Start from Caerphilly Castle before dropping down to the Welsh capital, Cardiff. Head to Penarth of the coast and then to the sands of Whitmore Bay. Follow the coast round to Llantwit Major before heading inland to Cowbridge. 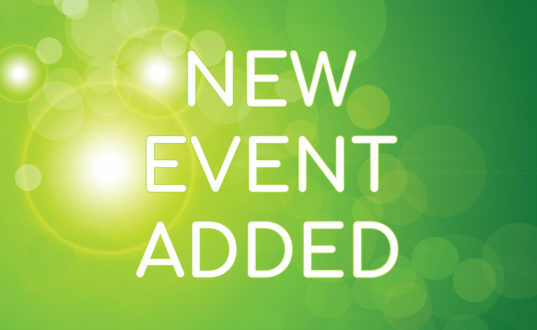 Revisit the coast at Ogmore via Bridgend before visiting Porthcawl and ending at Margam Castle. The 13th century castle is surrounded by extensive artificial lakes forming an elaborate water defence. In all covering around 30 acres it is the second largest castle in Britain. It is famous for having introduced concentric castle defences to Britain and for its large gatehouses. The vibrant capital city of Wales with a castle dating back to Roman times has undergone a massive regeneration of the former dock area with the Cardiff Bay barrage playing an important role. Attractions such as the Wales Millennium Centre, the National Assembly for Wales, shopping and watersports have since moved onto the waterfront. A seaside resort complete with Victorian pier and esplanade with plenty of places to sit looking across the Bristol Channel. The pier is home to the recently restored art deco Pier Pavilion. 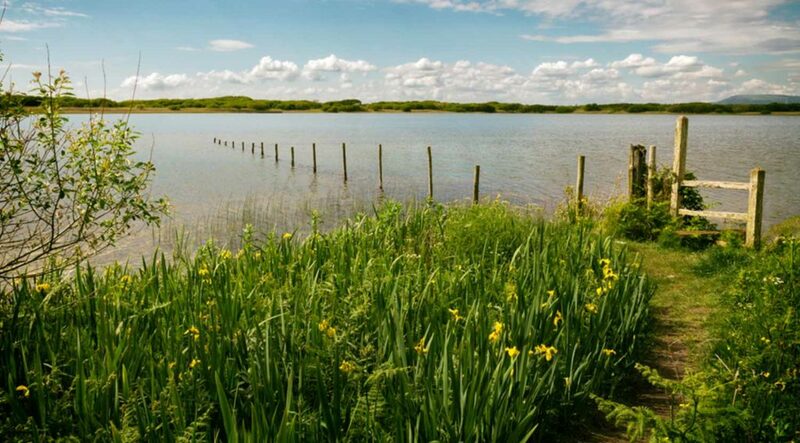 Nearby is the 180 acre Cosmeston Lakes Country Park & Mediaeval Village. Barry Island is located at the very southern tip of Wales. Whitmore Bay is its golden sandy beach sandwiched between two limestone headlands. It has a Pleasure Park, which lies just behind the beach, as well as some interesting buildings in Barry itself. 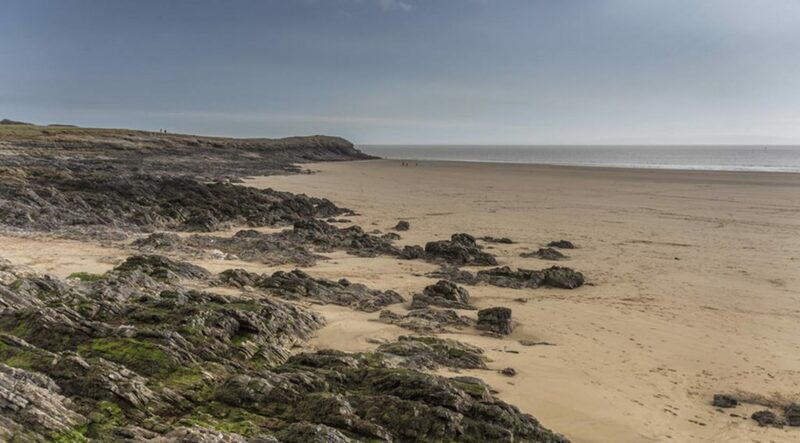 Popular with families and surfers alike, Cwm Col-huw beach is packed with all the facilities you need for a family day out such as rock-pools, a sandy beach and rugged cliffs. 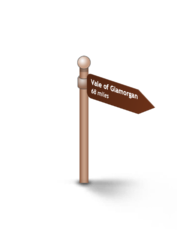 Wildlife can also be spotted at the Cwm Col-huw Nature Reserve which runs along the cliff tops to the west and back towards the town. The nearby town of Llantwit Major is steeped in history. One of very few medieval walled towns in Wales, and a substantial portion of the walls, together with the south gate, are still standing. The Town Hall served as a prison until 1830, when it was converted. 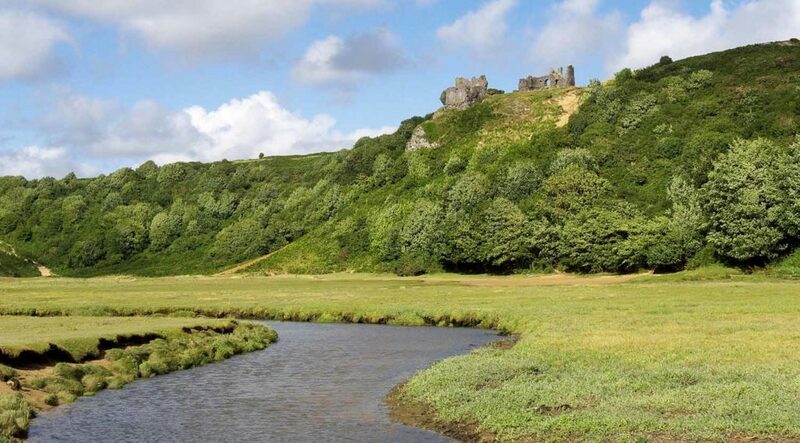 Dominated by its hilltop Castle, the original medieval settlement on the banks grew up around the pilgrims crossing point on the confluence of the three rivers - the Ogmore, Llynfi and Garw. The river Ogmore flows down the valley of the same name, on through Bridgend and down to the dramatic Heritage Coast at Merthyr Mawr. A seaside village probably takes its name from the large caves on the seashore by the river mouth. The rocks contain many fossils. The nearby sand dunes, some of the biggest in Europe, of Merthyr Mawr are a nature reserve which also featured in the film Lawrence of Arabia. 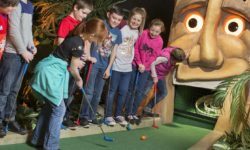 The coast winds its way around to the traditional seaside resort of Porthcawl before arriving at the internationally renowned Kenfig Nature Reserve. The area is well known for its golden sandy beaches with Newton Bay, Trecco Bay and Rest Bay regularly winning recognition for their cleanliness and facilities. 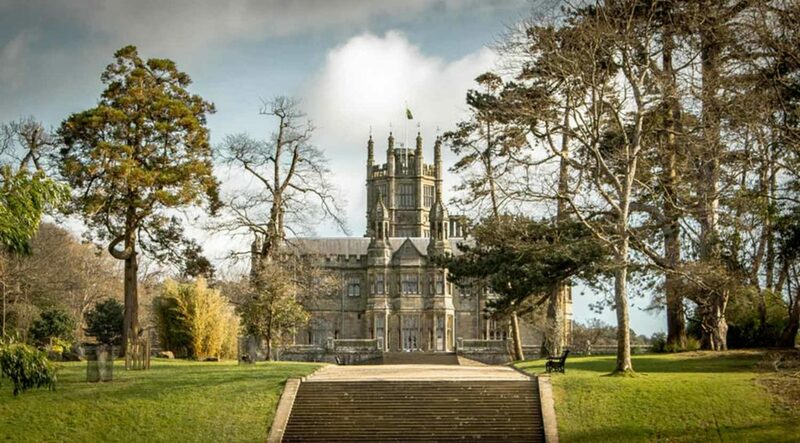 Margam Castle is a large country house, orangery and extensive gardens. It was built, from 1830 to 1840, on a site which had been occupied for some 4,000 years and which from the 11th century until the dissolution of the monasteries was an abbey. One of a number of mock castles built during the Gothic Revival. The trail takes in Cardiff and the South Wales beaches with some stunning castles along the way. 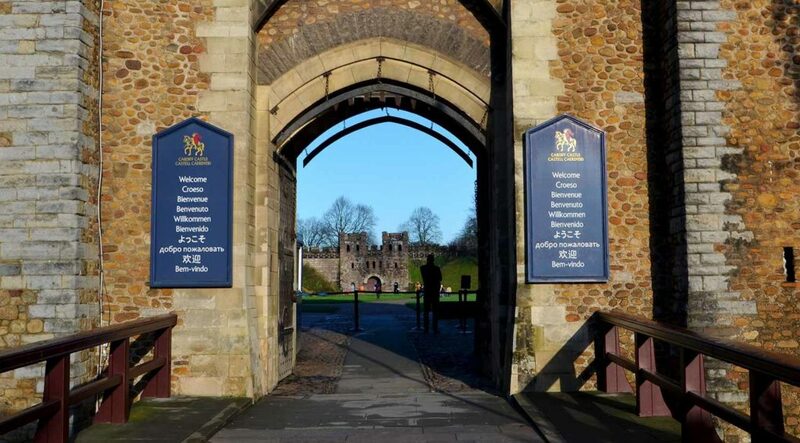 Start in Caerphilly and its 13th century castle and then on to Cardiff with its fascinating mixture of culture, history, shopping and nightlife. Relax in the Victorian charm of Penarth and its esplanade and pier before heading to Barry, site of one of the original Butlins holiday camps because of its glorious beach at Whitmore Bay. Llantwit Major and its Cwm col-huw beach have history, cliffs and rock pools to explore and is also popular with surfers. Drive inland to the medieval walled town of Cowbridge for a change of pace before continuing on to Bridgend. Newcastle Castle overlooks the town of Bridgend and its old bridge, built in 1425. 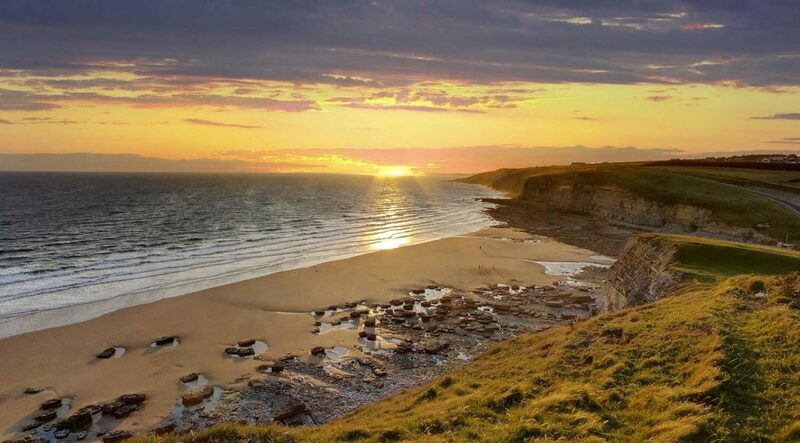 Head south past Ogmore Castle to the seaside village of Ogmore and the nearby massive sand dunes of Merthyr Mawr and on to the popular seaside resort of Porthcawl where there are a number of sandy beaches. End the trail at the mock Gothic Margam Castle exploring its extensive grounds and abbey ruins. There are numerous beaches on this stretch of coast, some sandy, some rocky and with the added attraction of seeing the odd fossil or two are a great attraction. Some like Whitmore Bay are wide and sandy, ideal for families, and others like Southerndown are backed by cliffs and caves for exploring. Caerphilly is the 2nd largest castle in Britain and ranks with the best in Europe. It is surrounded by man-made moats and lakes and was the latest design in construction for the later 13th century. Margam Castle is equally impressive if dating from the Victorian era of gothic designed mock castles. The regenerated capital city of Wales is unrecognisable, even from just a few years ago. It boasts a fascinating mix of cultural and historical sights, a revitalised Cardiff Bay area, sport, a varied music scene, great food and some seriously cool nightlife.